This is proper, organic, vintage, premium cider, in a "wine box" with tap so it lasts, for £1.77 a litre! Adsa were selling this for the about the same price but recently jacked up the price. 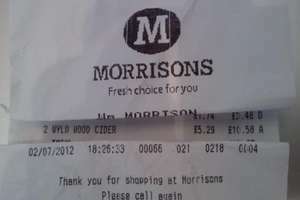 Morrisons now the cheapest supermarket for this. 1. Unbelievably cheap for the real thing. 2. Strong at 7.3%, not for the faint hearted, but all real ciders are this strong and practice makes perfect. None in Warley. Had a nice walk there though. Also saw the Water Tower for the first time, so the trip wasn't a total waste.